The beauty of Wrought Iron has endured the test of time. For hundreds of years the forging of Iron has captured mans imagination. Through forging, hammering and twisting designs that seem impossible are crafted into works of art. 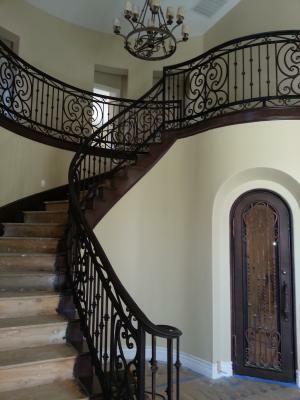 This staircase was built by hand in the USA, with attention paid to every detail, this Iron staircase railing was installed with complete precision. We here at Signature Iron Doors take personal pride in every iron railing, iron door, wine door, iron balcony or iron architectural piece that we build. We specialize in creating works of art in iron. Allow us to help you design and build your masterpiece! Please visit our showroom or our website today!